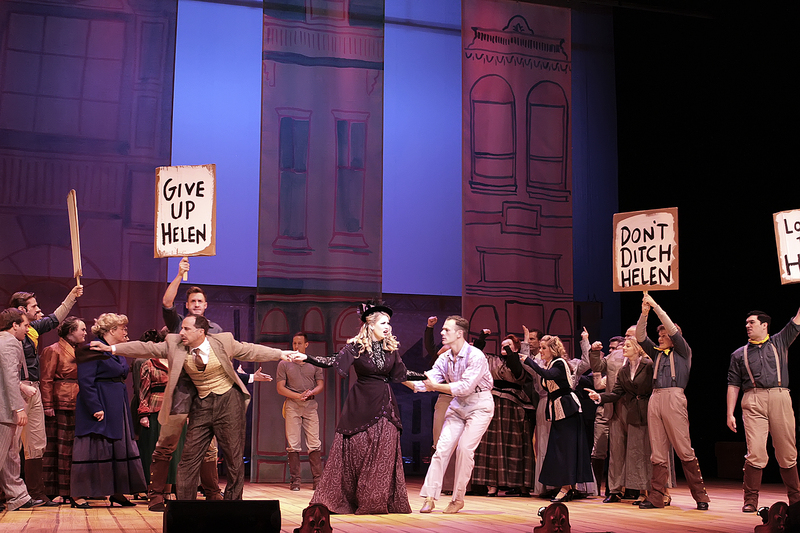 Lyric Stage presents the musical as it was meant to be seen – splash-less ending and all. KERA’s Shelley Kenneavy gets a taste of what makes this musical and this company so different. 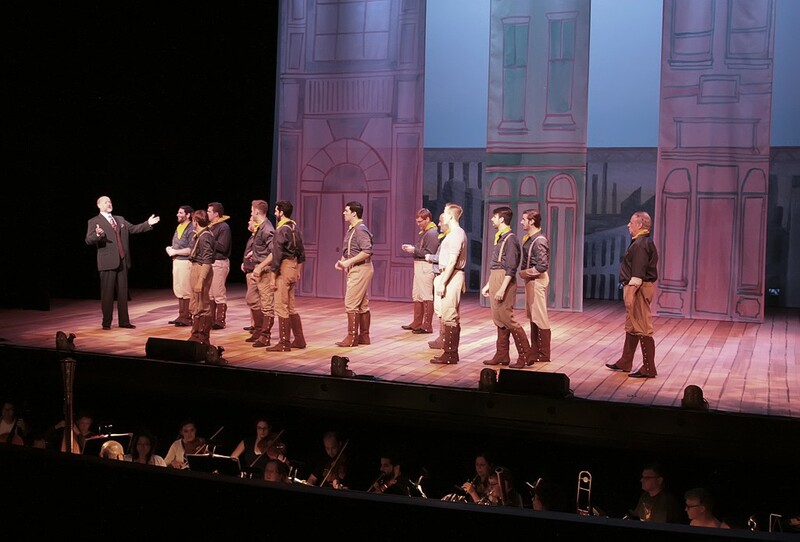 James Williams as Mayor Hector addresses his soldiers in “The Golden Apple.” Photo: Steven Jones. Lyric Stage in Irving is dedicated to preserving the American musical – whether that means premiering new ones or rediscovering classics. 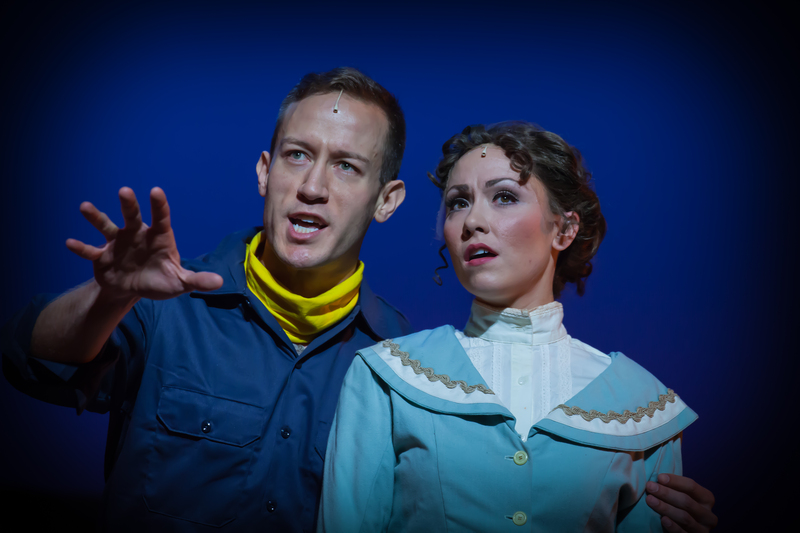 The company’s latest project is The Golden Apple – performed with the original Broadway orchestrations and the original ending. The Golden Apple was the first Off-Broadway show in history to win the NY Drama Critics Circle’s Best Musical award. The show is a re-telling of The Iliad and The Odyssey, set in Washington State after the Spanish-American War. It opened in 1954, and after earning raves and awards, it moved to Broadway – where it closed after only four months. Perhaps it was because the producers changed the ending to something more splashy for Broadway. The Golden Apple was also hailed for its groundbreaking, delicate sets, designed by William and Jean Eckart. The husband-and-wife team went on to design Broadway hits like Mame – and then had a second career teaching at SMU. Now, Lyric Stage has revived the show with the original ending and the original orchestration – which has never been done before. Susanna Moross Tarjan, daughter of the show’s composer, Jerome Moross, is excited to see a fleshed-out revival. She says it’s a difficult show to produce. In fact, it was one of the first sung-through musicals, a musical with only songs and no spoken dialogue – like Andrew Lloyd Webber’s Cats. Director Stefan Novinski thinks Lyric Stage’s reconstructions of original Broadway musicals adds an extra dimension for audiences seeing and hearing them. Novinski also thinks Moross, The Golden Apple’s composer, and John Latouche, the lyricist, were ahead of their time. Perhaps that’s why the show didn’t succeed on Broadway in a big way. Novinski points out, when Ulysses, the veteran, returns to his small town, there’s no rosy musical comedy ending. This is probably the only time someone will ever dare to call the brilliant lyrics of the brilliant John LaTouche——-unsophisticated. And, if I’m not mistaken, THE GOLDEN APPLE predates CANDIDE by a few years. Elaine Liner is undoubtedly the only person to ever dare call the lyrics of the great John LaTouche————————unsophisticated. And I’m pretty sure that THE GOLDEN APPLE predated CANDIDE by a few years. And also had lyrics by LaTouche. But unlike Cats, The Golden Apple is about something.